("Nifty Trails on the Hill"
The map is displayed below. Franz Inc. World Headquarters is near the bottom. The grocery store is in the middle, and a nice place to walk is toward the right. The first two entries in the example are street addresses while the third specifies a latitude and longitude directly. The first string in every entry is a label to display when the user moves the mouse cursor over the marker for that location. When a street address (or a more general indicator such as "Oakland, CA") is specified, a Google service is used to convert the address to a latitude and longitude. The set of all requested locations will be centered in the map, and the maximum zoom level that can display all locations simultaneously will be used. Go ahead and place the program code below into a file and compile and load it (or simply evaluate it). (The code can also be downloaded from here.) Then evaluate the example call above. The HTML Browser window displayed above should appear and display the map. Here's a second example that adds an entry for the whole city of San Francisco. When you evaluate this form, notice how the map will automatically be zoomed farther out in order to encompass the broader range of locations. This example shows a "hybrid" map that combines features of the street and satellite views. This last example shows only a single location, and initially shows the satellite view. Displaying only a single location causes it to zoom in as far as possible. 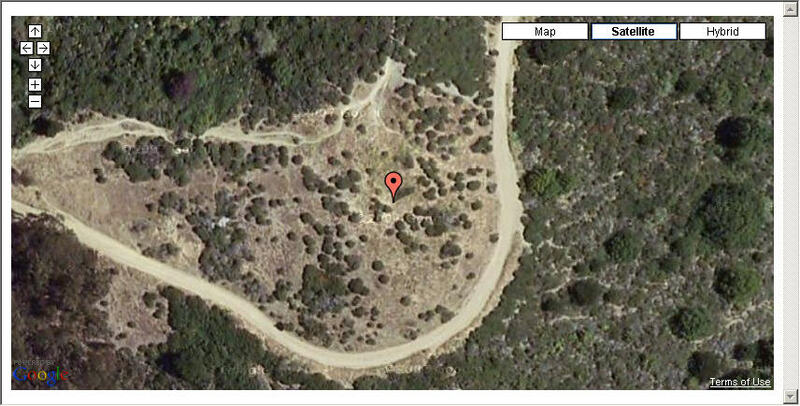 (display-addresses '(("Nifty Trails on the Hill"
Now try some addresses of your own! If you want to try adding other Google Maps features to this code, the Google Maps API is documented here: http://code.google.com/apis/maps/documentation/. Here is the code. It can also be downloaded from here. 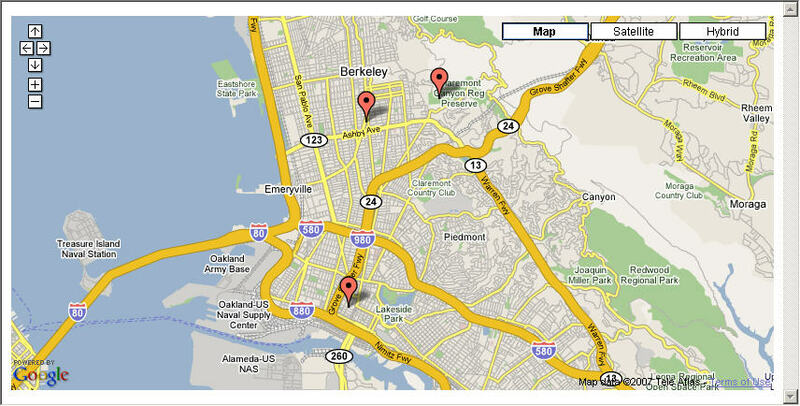 ;;; Here is a Google Maps API key that was generated for the franz.com domain. ;;; This web page skeleton comprises most of this example code. 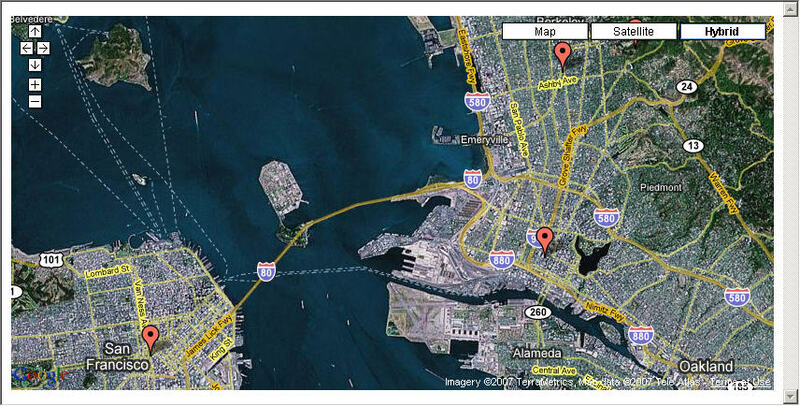 <!-- This small script loads the Google Maps code and validates the key. // A couple of objects to create once at load time. // loaded, due to the onload attribute of the body element below. // that's in the static HTML below. // to be the midpoint of all marked locations. // Set the map type (street, satellite, or hybrid). // The lisp code will fill in the requested type. // Enable zooming with the mouse's scroll wheel. // Add the standard Google Maps navigation control. // Add buttons for changing the type of map that is viewed. // Add markers for a set of locations. // addPlace for each explicit latitude and longitude. // and then call addPlace to mark that location. // that must be done after the coordinates are known. // Create a marker for a particular lattitude and longitude. // move off the map entirely. map.openInfoWindowHtml (point, (label + \"<br>\"
// Add the new marker to the map. // so that we can make the map encompass all of them. // we have marked so far. ;; you could pass the widget here. ;; The is the user-callable entry-point function. ;; an address string or a latitude number and a longitude number. ;; Make sure each entry is of one of the valid forms. (screen *system*) "Bad Location Value"
;; a latitude and longitude directly. then (format string-out "  addPlace (map, ~a, ~a, ~s);~%"
;; Otherwise it specifies an address. else (format string-out "  addAddress (map, ~s, ~s);~%"
;; so you can see the code that was generated. ;; not update it, so you'll need to use File | Revert to Saved. ;; is an IDE window, as it is with the default argument value). ;; paste into some third-party HTML browser.